the right of the individual to life, liberty, security of the person and enjoyment of property and the right not to be deprived thereof except by due process of law[.]S. 4(a), 1976 Constitution of Trinidad and Tobago (as amended through 2000). The Constitution established the Police Service Commission to "exercise disciplinary control" over law enforcement officers and "to enforce standards of conduct on such officers".S. 123, 1976 Constitution of Trinidad and Tobago (as amended through 2000). * Trinidad and Tobago denounced (i.e. withdrew from) the 1969 Inter-American Convention on Human Rights in 1998. Its withdrawal became effective in 1999 but did not apply to cases that resulted from facts prior to this date. The Trinidad and Tobago Police Service declares that its officers will "protect human dignity and maintain and uphold the rights of all persons." The use of force policy for the Police Service has not been made public. In June 2017, it was reported that the Service was in the process of reviewing its policy to allow for the implementation of non-lethal weapons. 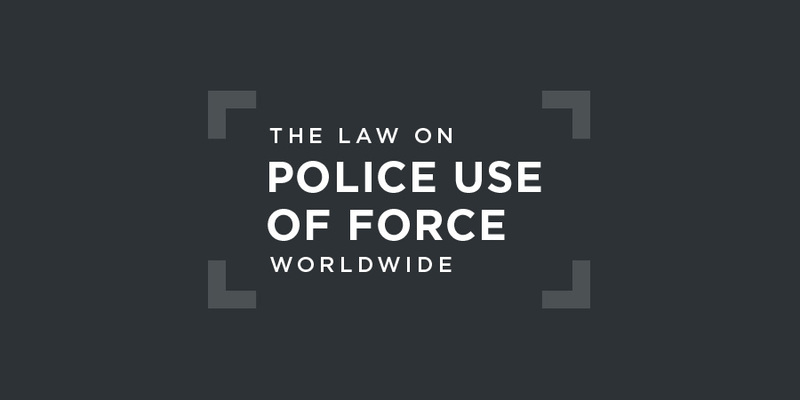 In October 2017, Inspector Kazim Ali of the Trinidad and Tobago Police Service’s Legal Department publicly urged all police officers to “use force as necessary” when confronted by "unruly people". Inspector Ali said that under the Criminal Offences Act, officers are entitled to defend themselves when attacked by people in the execution of their duties. For the purpose of preventing escape or violent assault, and for the purpose of preventing or suppressing mutiny, any officer having charge of any prisoners may use firearms or any other mode of force, and shall not be responsible for the consequences of the use, if necessary for any of the purposes mentioned above. The Police Complaints Authority of Trinidad and Tobago is an independent body for members of the public to submit complaints against police officers with a view to curbing the use of unnecessary force by the police service in the conduct of their work. It was established by the 2006 Police Complaints Authority Act (as amended through 2011). following his arrest on 7 September 1978, he was taken to a police station, where he was subjected to beatings and physical abuse and forced to sign a statement placing him on the scene of the murder. On 11 September, he complained about this treatment before the Magistrate's Court and a medical examination was ordered. The examination apparently was inconclusive, showing minor injuries that also could have been inflicted by the author himself. The issue was also raised before the court of first instance and on appeal. Some passages of the summing-up by the judge presiding over the retrial describe the nature of the psychological pressure and degrading treatment to which the author was allegedly subjected to in custody.Human Rights Committee, Soogrim v. Trinidad and Tobago, 1993, §3.2. On 2 February 1987 and again on 21 September 1988, he was allegedly beaten by prison warders and, on another occasion, left naked in a cold cell fortwo weeks. His complaints to the prison authorities were not followed up. He identifies the warders and prison officials whom he holds responsible for his continuously deteriorating state of health. In this context, he indicates that the virtually complete lack of exercise and sunlight in the prison has caused arthritis in his joints: furthermore, his eyesight has deteriorated during more than 10 years on death row, so that the prison doctor referred him to an eye clinic. The Commissioner of Prisons, however, informed him that there was no money for such medical treatment and that in any case he was in prison to die.Human Rights Committee, Soogrim v. Trinidad and Tobago, 1993, §3.4. The Committee was of the view that a violation of Article 7 of the 1966 International Covenant on Civil and Political Rights had occurred, "in so far as the author was beaten by prison warders on several occasions".Human Rights Committee, Soogrim v. Trinidad and Tobago, 1993, §14. is under an obligation erga omnes to abstain from imposing corporal punishment, as well as to prevent their administration, for constituting, in any circumstance, a cruel, inhuman or degrading treatment or punishment.Inter-American Court of Human Rights (IACtHR), Caesar v. Trinidad and Tobago, Judgment, 11 March 2005, §70. The judgment concerned facts that occurred prior to Trinidad and Tobago's denunciation of the ACHR. In early May 2018, Acting Police Commissioner Stephen Williams ordered an investigation into a shooting incident involving two police officers which occurred at Grand Bazaar. The shooting reportedly stemmed from a love triangle involving a sergeant, his wife, and a corporal. The two men were taken to hospital suffering from multiple gunshot wounds. Both men were said to be in a stable condition. At the end of the day the question of whether reasonable force was used is a question for me to answer. I have to determine whether the force used by the police officers was reasonable. The mere statement that reasonable force was used does nothing to discharge the burden of proof placed on the defendant in this regard. While such a statement may have some place in a pleading it has no place in evidence. A defendant relying on such a defence must give evidence of what was done so that the judge can determine whether that action was reasonable given the circumstances.High Court, Bartholomew and others v Attorney-General, Judgment, 13 January 2011, §34.